Rory McEwen (1932–82) had a surfeit of talents. As a famous folk-singer in the 1950–1960s, together with his younger brother, Alex, his most influential achievement was to host the ground breaking late-night television folk and blues show Hullabaloo, forerunner of Later with Jools Holland. Years after cancer had cruelly struck him down, his youngest daughter Christabel became Mrs Jools Holland, a marriage apparently written in the stars. 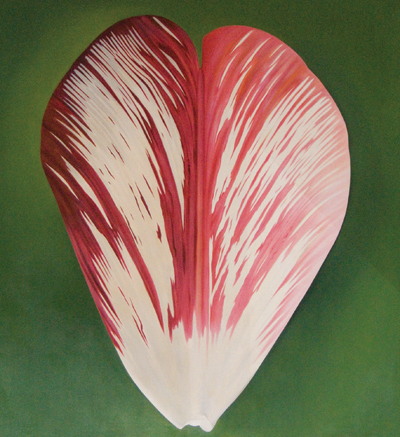 Wilfrid Blunt, Eton’s drawing master and ultimate authority on botanical art, wrote: ‘Perhaps the most gifted artist that passed through my hands was Rory McEwen.’ They later collaborated on Tulipomania, a deluxe limited-edition book on tulips. Blunt was an early inspiration, as were his flower-loving mother (a great-granddaughter of the botanist John Lindley, saviour of Kew Gardens) and his brother-in-law’s collection of Redoute’s original watercolours of roses. McEwen aspired to ‘paint flowers as a way of getting as close as possible to what I perceive as the truth’, romantically inseparable from beauty. To this end, he broke the bounds of botanical illustration. From meticulous water colours on vellum (calfskin), he moved to large oil paintings on canvas of single tulip petals many times life-size. This took him into the Modernist mainstream, allying his work with Abstract art, especially Minimalism. Like many artists, he particularly liked tulips. He was patron of the Wakefield and North of England Tulip Society sole guardian of the English Florists’ tulip, whether virally ‘rectified’ to have marginally ‘feathered’ colouring or, as here, centrally and exuberantly ‘flamed’. A member created Tulipa Rory McEwen Bybloemen Flame, which flourishes.